← One day you’ll turn on the ESPYs and see my face. Basketball has it’s own history, and though I know a fair bit about players from ‘back in the day,’ watching them play in their element creates a whole new way of understanding them. You don’t get half the feel of the player from just studying their wikipedia page. 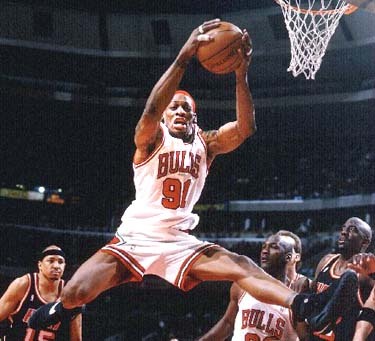 A couple of days ago I was watching an old Allstar game, and I was particularly fascinated with one person- Dennis Rodman. Yes, I’ve heard the funny stories, read articles, stalked the wiki, but I had never actually watched him play until a few days ago. Boy have I been missing OUT. Everybody hates Dennis the Menace. Well, not everyone, but you know what I mean. He always created such a rival atmosphere, and took advantage of it by enjoying every second. He was almost like the Lebron James of that time. You’ve got the die hard fans, but with that comes the OH MY GOSH I HATE DENNIS RODMAN club. Personally, I friggin’ love him. Specifically pointed out for his amazing defensive and rebounding skills, he is arguably the best rebounding forward in NBA history. I agree wholeheartedly. 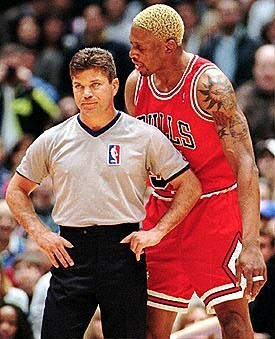 In June of 1997, during the playoffs, Rodman was fined the largest fine from the NBA of time that because made a comment about Mormons. It’s funny because I’m Mormon…hah. Wild thang. Now “Worm” is one of my favourite players of all time to watch. From his ever-changing hair to his hilarious altercations, it’s never the same old-same old to watch him play. I’ll definitely be rolling the tapes as much as I can, because Dennis Rodmans don’t come around that often. And when they do, you’ll wanna be watchin’ ’em.